I suppose you could say that I have two major hobbies, history and beer. I have been a CAMRA (Campaign for Real Ale) member since 1992 and I have been researching family history for nearly as long. About four years ago I really started getting interested in the First World War and I have been a supporter of the Barnsley War Memorials Project (BWMP) since it began in early 2014. Their project to index all the war time (August 1914 - March 1919) issues of the Barnsley Chronicle has almost reached a successful conclusion with just a couple of months worth of issues yet to be transcribed. I have contributed a few issues, in between my other WW1 volunteer work for the Imperial War Museum (IWM), mainly because I find indexing a nice calming and yet fascinating job. Today I was looking the 30 October 1915 issue of the Barnsley Chronicle (with thanks to Barnsley Archives for letting the BWMP have access to the digital version) and amongst a gallery of photos of fallen soldiers on the front page I spotted a familiar name. The soldier was a Private Kilner and his picture was very clear. As the years progress and the numbers of casualties increase the images get smaller and grainier (is that a word?) but in 1915 the newspaper still managed to print nice clear photos - depending on what they had been given by the families I suppose. There are Kilners from Mapplewell and Smithies in the OH's family tree - a connection by marriage and marriage again admittedly, but I traced them years ago idly wondering if there was a link to the Kilner family of the famous jar. Who, as revealed on 'Who Do You Think You Are?' a few years ago, are related to Jeremy Clarkson, previously of 'Top Gear'. I searched for other mentions of Private Kilner and found that a piece reporting his death was apparently in the previous issue of the newspaper, 23 October 1915. The index the BWMP is creating is being made available as a printed copy on the open shelves of Barnsley Archives and the Project have also supplied the Archives with a searchable digital version. The index just gives a few words about each entry for a serviceman or woman, but I could see that John William Kilner was from Chapeltown, so probably not a relative of the OH's relatives. Having invested a little time in this soldier I didn't want to let him go until I'd found out more about him. There is a really good website for Sheffield Soldiers in WW1 and Sheffield Memorials, so I looked Pte Kilner up on that. Sure enough he is remembered on the memorial in Chapeltown Park. I also looked him up on Lives of the First World War, only to discover that I had already remembered him as a Barnsley connected soldier! He had apparently attended Barnsley Holgate Grammar School and is remembered on the Old Boys memorial which is now in the Cooper Art Gallery in Barnsley. I have a copy of the recent book, 'Great Sacrifice', about the men and boys remembered on the Grammar School memorial, so I looked up John William Kilner. In 1911 John's father, William Kilner, was the landlord of the White Horse Hotel in Market Place, Chapeltown. Ah, ha! Now there is a pub involved in the story I am getting very interested. 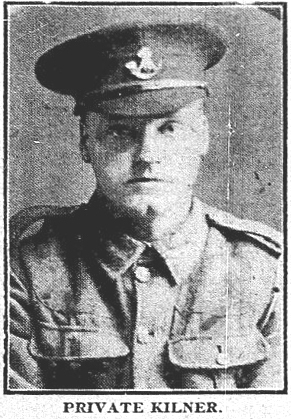 The piece from the 23 October issue of the Chronicle has been fully transcribed in the book and William Savage, sanitary inspector of Barnsley, which sounds quite important, is mentioned as the soldier's uncle. So John William was quite connected to Barnsley despite my disappointment in him not being another branch for the OH's family tree. As it happens there are also Savages in the OH's family. I met his great-uncle by marriage, who is a Savage, at a family gathering and I did some work on his line for him following a lovely chat at that meeting. The Savage family came to Barnsley from Newark in Nottinghamshire, in the early 19th century and set up as Linen weavers. Before long they had expanded into more into the business end of things, becoming warehousemen and linen factors. In 1864 George Savage was the Inspector of Nuisances in Barnsley (what a lovely title!) There is a lot more about the Savage family in a little book by the Barnsley Family History Society called 'Moving Lives'. Once I had completed my calculations it turned out that Pte Kilner was the OH's great-uncle's 3rd cousin once removed! I have found a photo of the White Horse Hotel in Chapeltown. I have asked for permission to use it on my blog, but in the meantime here is a link to the picture on the Ecclesfield District Archives. If I get permission I might write more about the Kilners and the Savages their links to another pub in the Chapeltown area. Leaving you on that hopeful note - thanks for reading!